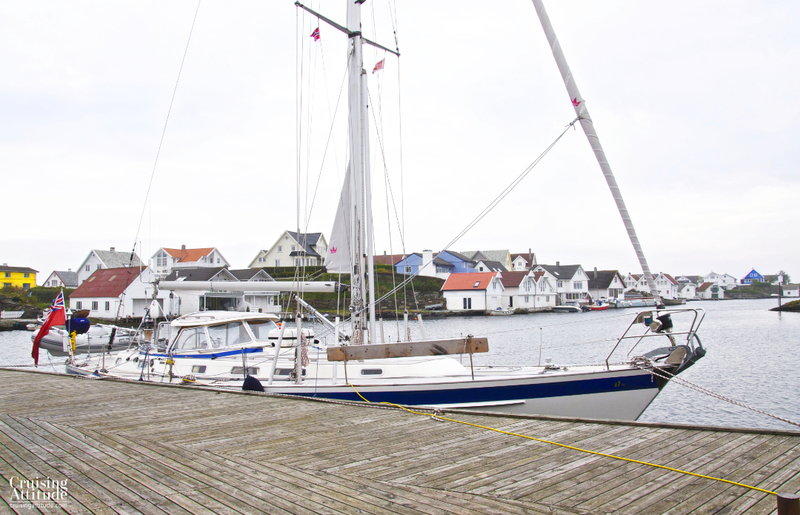 After a wet voyage rounding Lindenes, we were happy to finally come into the port town of Farsund. First task: dry everything out! We had to rinse and hang all of the cockpit bench cushions as well as our life vests, foulies and boots as they had gotten a thorough drenching throughout the day. 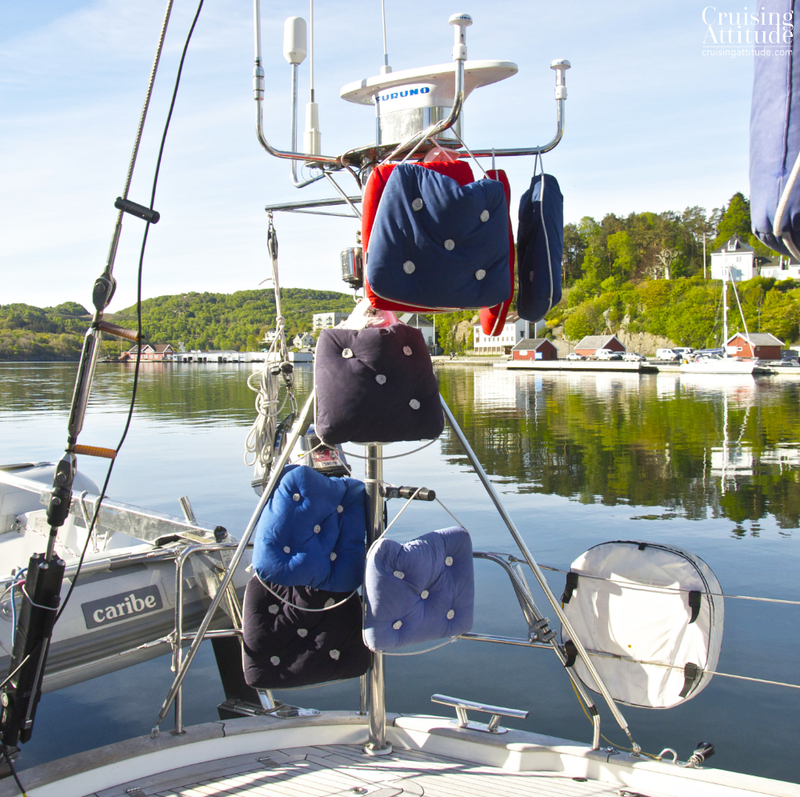 Drying out the cockpit cushions at Farsund marina. The marina was empty except for one other boat that was planning to make the passage down to the UK and then onwards for a circumnavigation. They had bicycles and skis (!) lashed to the deck. The marina is quite handy as it’s next to a supermarket — and one of the state-run liquor shops in case you’ve run out of wine or beer. I wouldn’t advise the purchase of anything stronger as it’s tremendously expensive here in Norway (liquor tax depends on the level of alcohol). 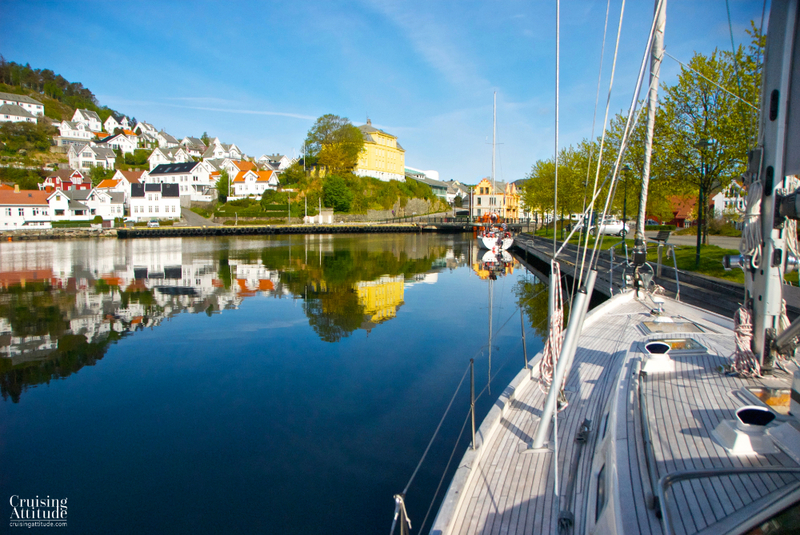 Farsund has preserved it’s small town charm — we were impressed that the new architecture blends in perfectly with the older buildings from the 1800’s and early 1900’s. 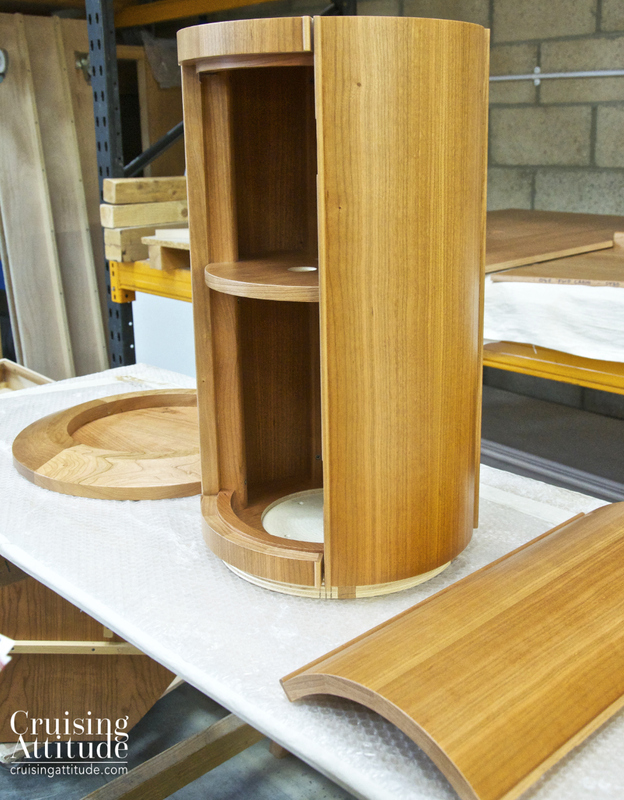 Everything is built in wood, obviously an abundant natural resource here. 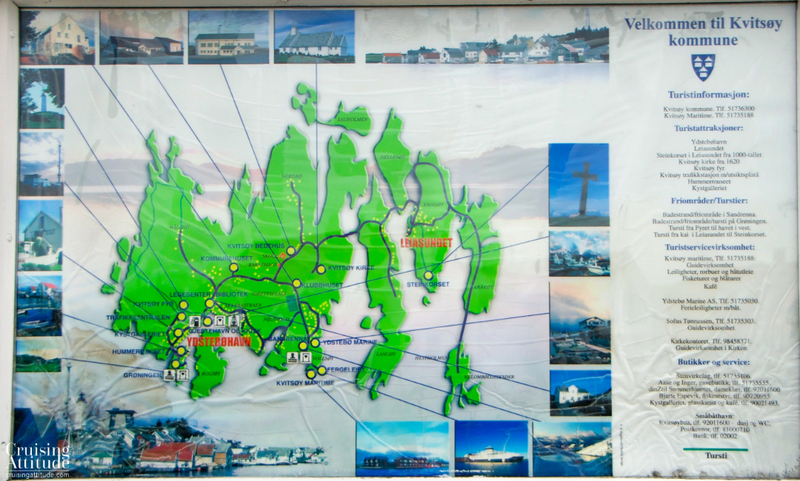 It provides for some nice walks to explore the town and the neighbouring forests and fjords. We also had a short lesson in maintenance and repair after breakfast. 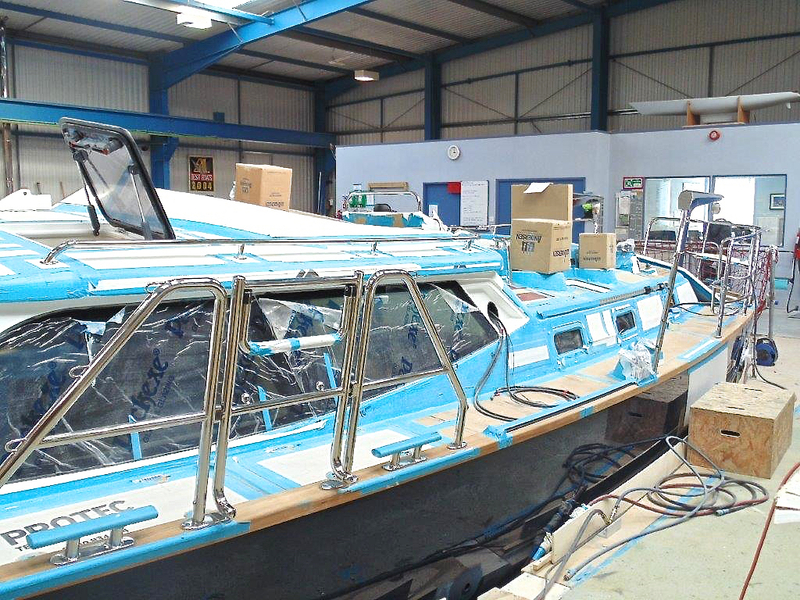 Things will break and wear out on your boat, even if it’s brand new, we learned. Leon told us we’re lucky that we complement each other in our skills. Jacques has the hands-on mechanical skills and I have more of a “geek” skill set. If anything electronic stops working, I can trouble-shoot and usually find what’s wrong, and if anything mechanical stops working, Jacques can do the same. We learned to have lots of spares on the boat, high-quality tools (the cheap ones will rust quickly) and a good method for organising them. 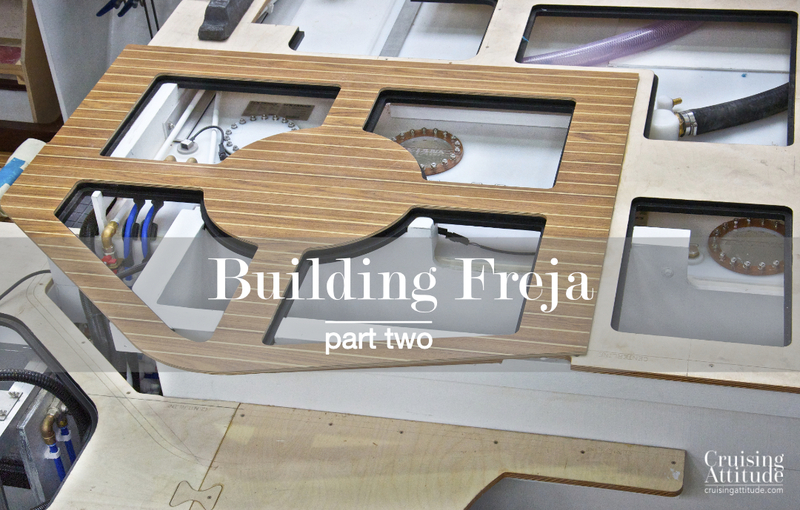 Nothing is more frustrating that not finding the part or the tool that you know you have — somewhere. As we left the lovely town of Farsund, we noticed the first signs on deteriorating weather towards the west — bands of wispy cirrus clouds that warn you of a warm front coming through and usually rain within 24 hours. Best to take full advantage of our last sunny day! 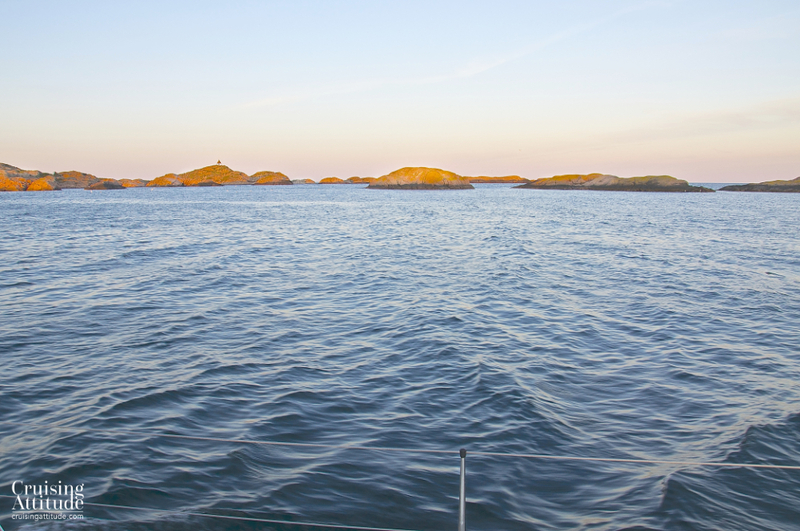 Coming out of Farsund, you can see the cape of Lindesnes in the distance on a clear day. 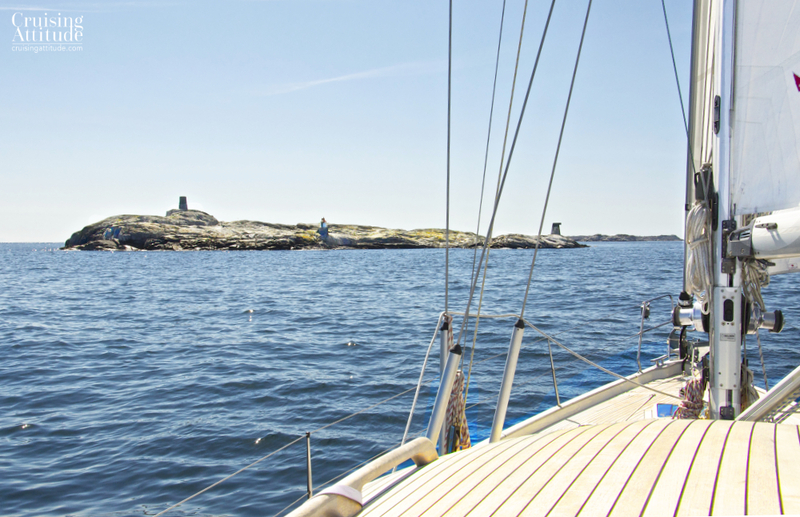 To get to Kirkehamn (Church Harbour)/Hidra, we had to round Lista Point and sail north through a narrow fjord. The entry to Kirkehamn is quite dramatic. As you approach, you come closer and closer to a lone white wooden church perched on a hill at the end of the fjord. It seems as if that church is the only thing in the harbour. When you actually get to the harbour at the end of the fjord you notice that it is actually a large fishing village. 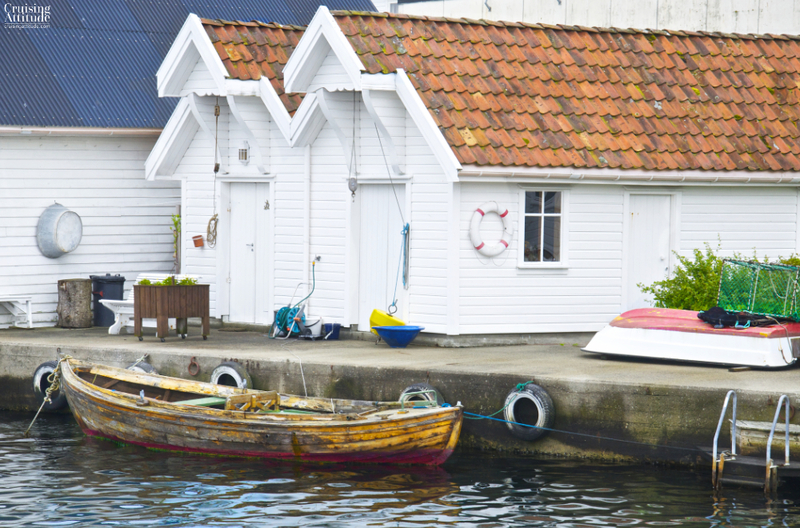 We imaged that many of the houses you see at Kirkehamn are actually summer houses, as their couldn’t be that many fishing families here. During our sail, we learned a little trick for rolling in your mainsail when you’re running before the wind. What you need to do is position yourself so the wind is 180° directly behind you. Haul in the mainsail sheet so the boom is stationary, and then furl in as usual. Works like a charm. We docked at a small marina on the opposite side of the harbour from the fishing boat harbour, Isbua marina. We were the only boat on this cold but sunny day. At this time of year (first week of May) the marina was free of charge, but no electricity, nor WiFi was available. The “season” there begins around mid-May, after which the fee is 200 NOK including electricity and WiFi. After securing the boat, we decided to go for a hike to the top of Hidra Island. The views were breathtaking! 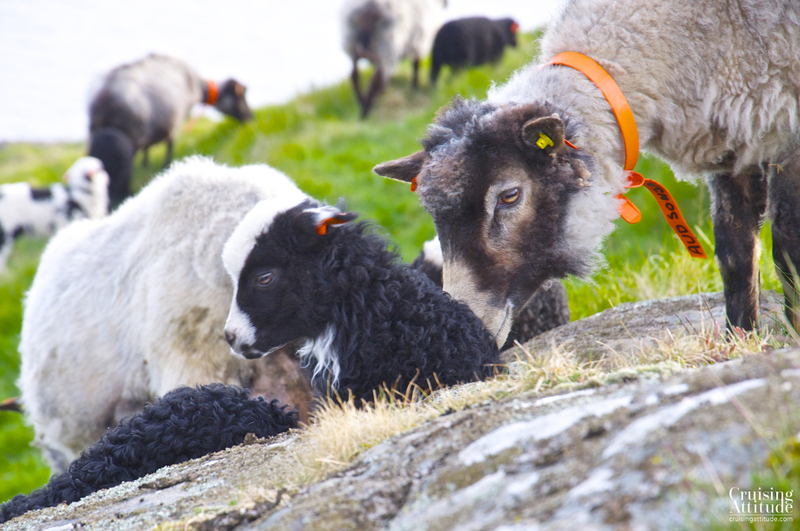 The island is home to a large flock of multi-coloured sheep. 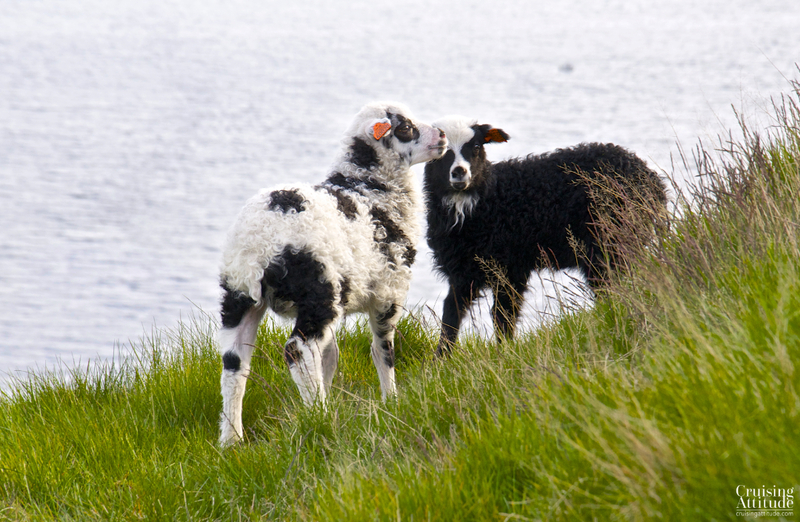 As it was spring and lambing season, we saw lots of little ones. We hoped they appreciated the wonderful ocean views of their island pasture. The cirrus clouds of the yesterday did indeed foretell rain within the next 24 hours. We woke up to a heavy downpour. After a warm and hearty Swedish breakfast (herring, liver paste, crispbread, eggs and coffee) we went seeking fresh fish for our evening dinner. We were in a fishing village after all. We docked in front of the “fish hall”, where the morning’s catch was brought in, sorted and organised for sale. 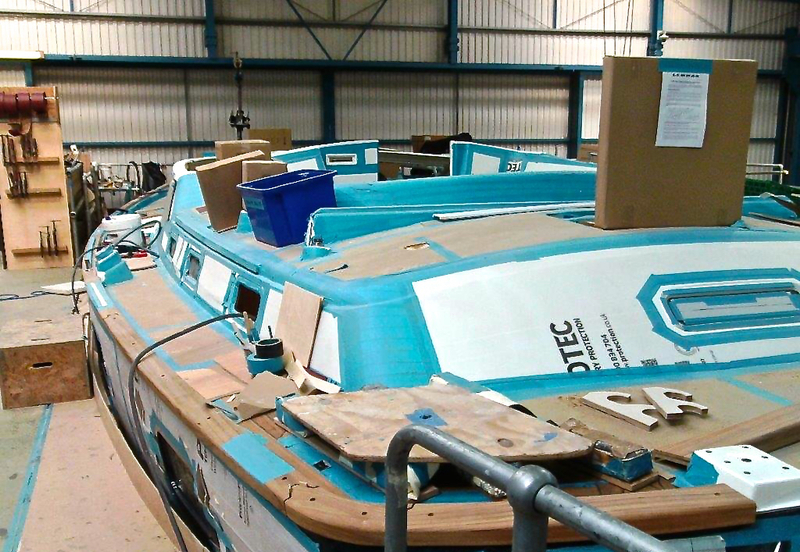 You need a fender board for this as fishing boat pontoons are not made for fibreglass hulled sailboats. 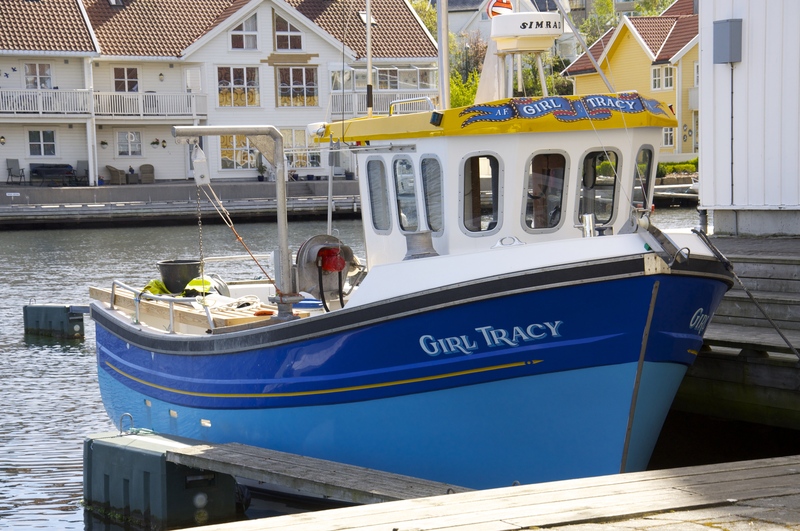 Norway is not know for being a low-price country, but I can tell you that buying fish directly from the fisherman is a real deal. It’s fresh off the boat and 5 times cheaper than buying it at the supermarket or even the marketplace in town. We left Kirkehamn with the goal of arriving in Egersund early enough to do some grocery shopping. We now had lots of fish but not much else. The visibility got increasingly worse throughout the day and it was easy to forget the past 5 days of brilliant sunshine. As we entered the channel of Egersund, we had a lesson in using the Furuno radar overlay on the chart plotter. This way, you see the AIS IDs on boat that are transmitting, and you see the radar signatures of boats or other things that are not transmitting an AIS signal, all on top of your chart. 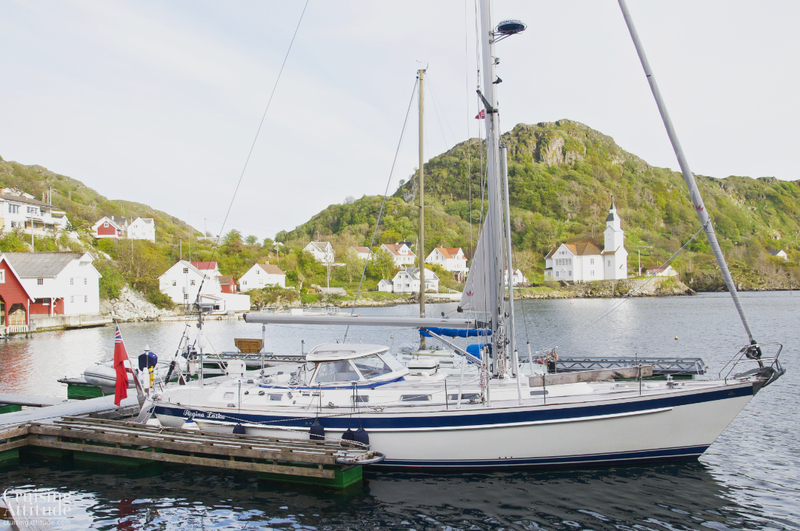 The marina in Egersund is well-protected at the end of the eastern branch of the bay. But be careful — a small river empties into the bay at the visitor’s pontoons and the sideways current can be two-three knots depending on how close your place is are to the mouth of the river and if it’s been raining. 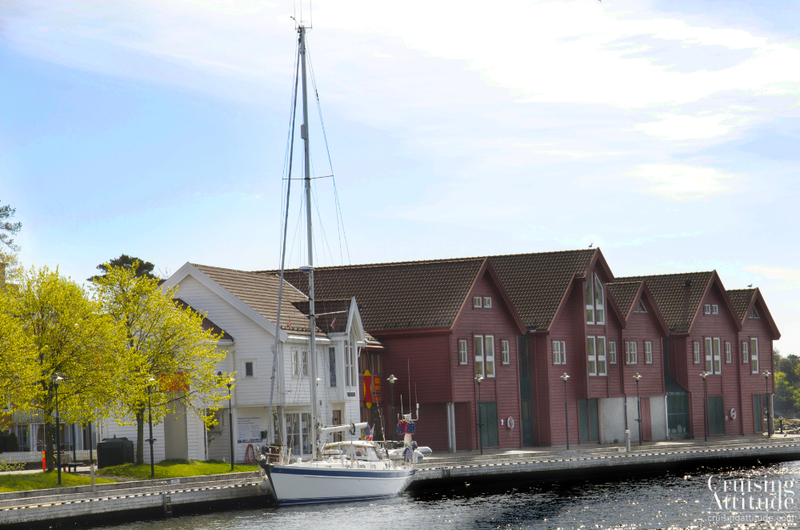 The marina is also just across the road from a shopping centre with a large, well-stocked grocery store. There’s also a pharmacy, a liquor store and a veterinarian close to the marina. Facilities included: water, electricity, toilets, showers, Wi-fi, laundry (washer and dryer). 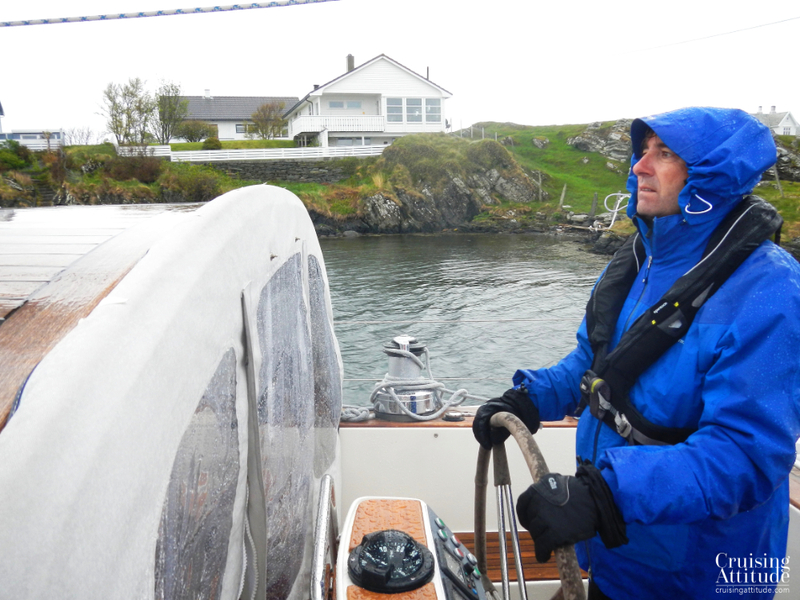 The voyage from Egersund to Kvitsøy would have been lovely but for the rain and mist. Our visibility was around 2 nautical miles. 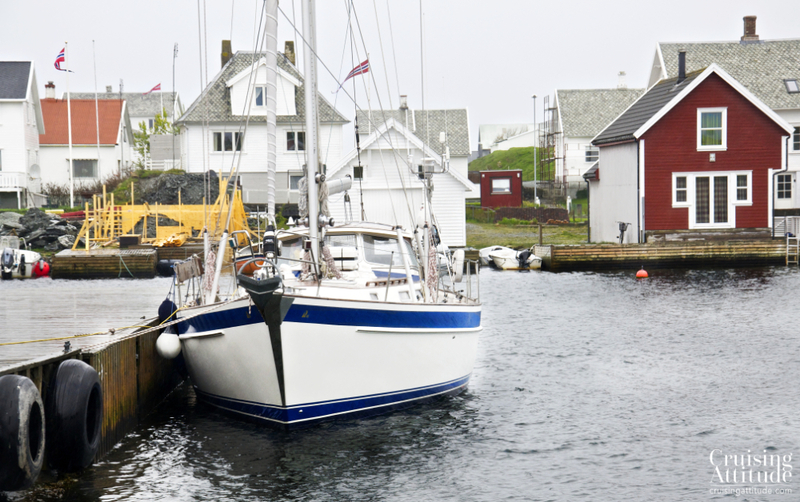 The marina of Ydstebøhamn on Kvitsøy. 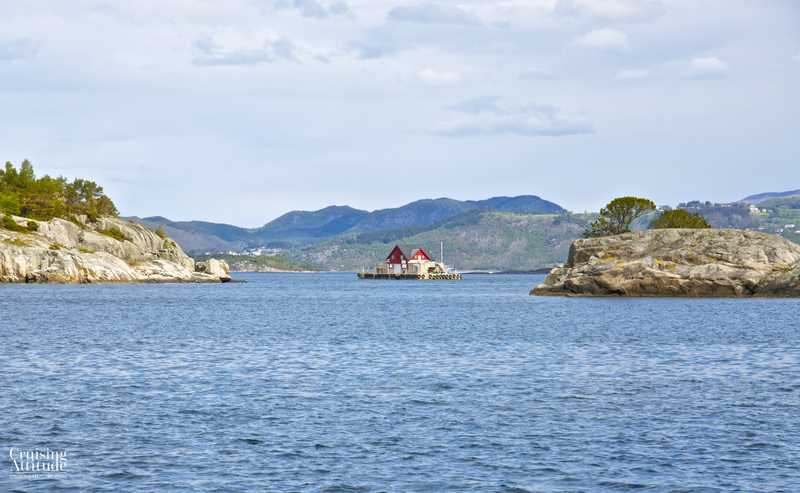 Kvitsøy is a group of islands on the outer coast, not far from Stavanger. During the summer, it’s full of vacationing Norwegians, but during a rainy, chilly first week of May, it’s pretty much guaranteed to be empty. It’s a wind-blown place, being out in the north sea and totally exposed to the worst westerly storms. As as result, there are no trees on the islands. There’s lots of grass though, which makes the many resident sheep happy. We didn’t see a single person as we motored to the single marina in “town”. 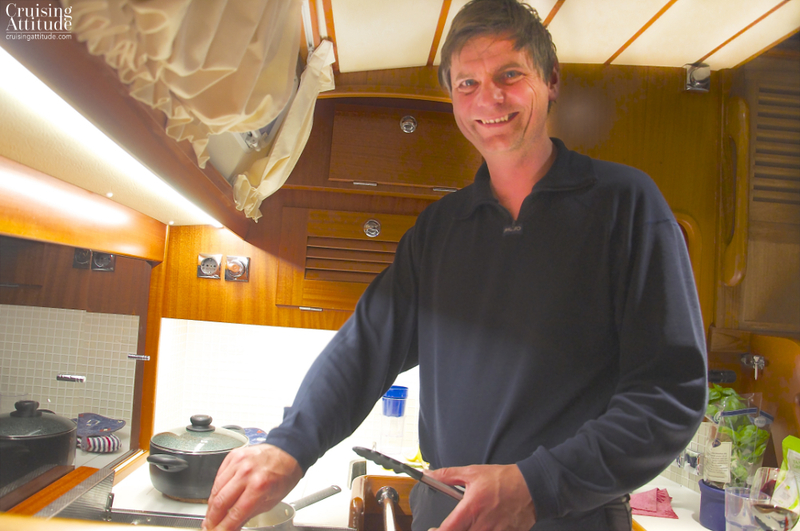 We were happy to be in the warmth of the boat, eating a hearty dinner cooked up be Leon and drinking good wine – in this case, a bottle of our own Merlot 2010. Price (as of March 2016): 100 NOK. Facilities included: water, electricity, toilets, showers, Wi-fi. There’s a small grocery shop and a few galleries that are open during the summer. Telephone: +47 51 73 63 10. 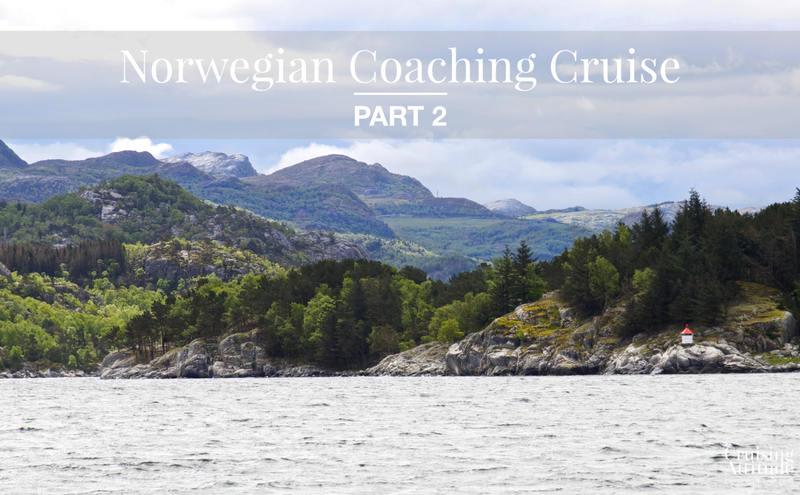 We were full of anticipation – we were going to visit the beautiful Lysefjord today! This fjord is famous for the Preikestolen (Pullpit Rock), cliff that stands over 600 meters (2,000 feet) over the water. It’s wide and flat at the top, making it a perfect place to be photographed with the mountains and fjord in the background. Visit this page to get directions for hiking up the mountain to reach the Pulpit Rock. The weather had not improved overnight and we were off to a drizzly start. 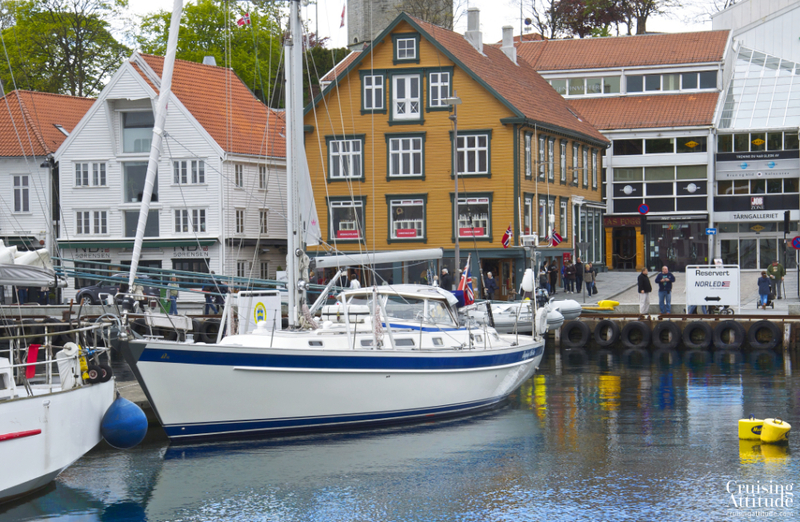 After an hour of sailing we began to approve the environs of Stavanger, a lovely city know for being the centre of the oil industry in Norway. Not that there are many oil platforms around Stavanger. It’s more because it’s the centre for the provisioning of the special materials, ships and know-how for the industry and the headquarters for the Norwegian State-run Oil Company Statoil. We say lots of strangely-shaped boats and barges around the harbour. We passed the outer harbour of Stavanger on our way to the Lysefjord. Dark grey clouds, almost the colour of asphalt, hung over the mountains. Amazingly, the rain stopped as we passed Stavanger. There were even a few holes in the cloud cover, providing striking contrasts with the swollen grey clouds towards the inland mountains. At we turned northeast into the Lysefjorden, the wind turned against us. In the fjords, you wither have the wind at your back or on the nose. We started the motor for our trip up the fjord. The landscape is as you would imagine — sheer granite walls that continue into the water down to a depth of over 400 meters (over 1’300 feet) in certain areas. No anchoring in the fjord! The weather was slowly improving as well, and we saw more and of the sun shining through gaps in the cloud cover. 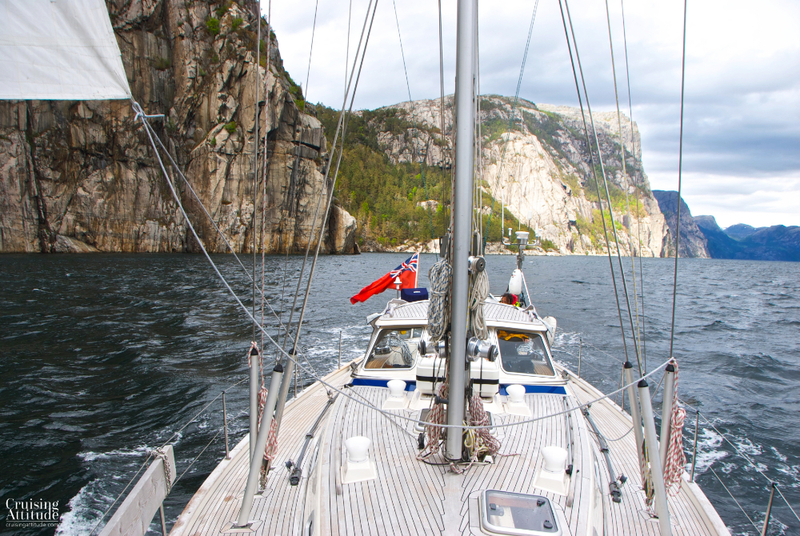 The Lysefjord is one of the shortest of the famous Norwegian fjords at only 42 kilometres, so you have ample time to sail up and back down during a single day. 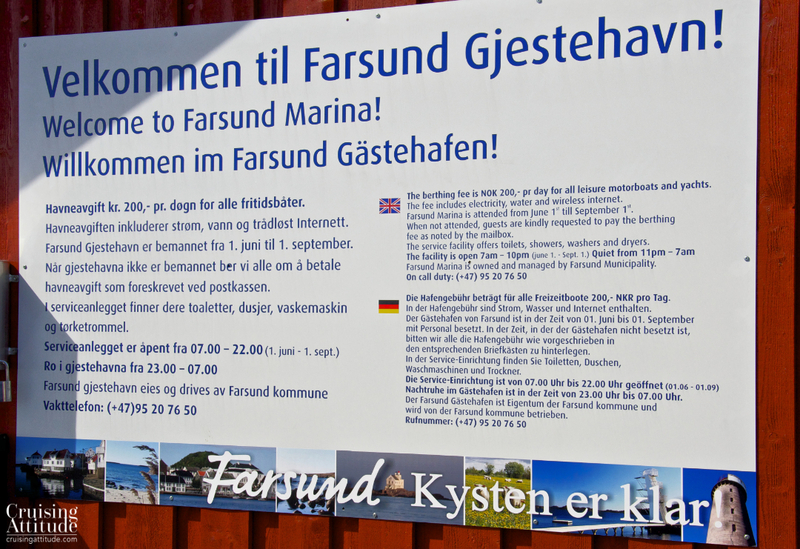 The marina at the entrance of the fjord at Forsand is small and cosy. 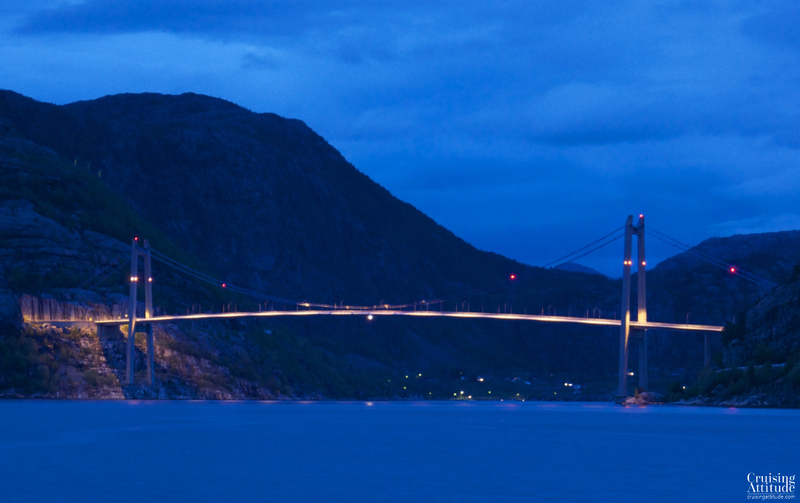 It’s located close to the only bridge that spans the fjord. 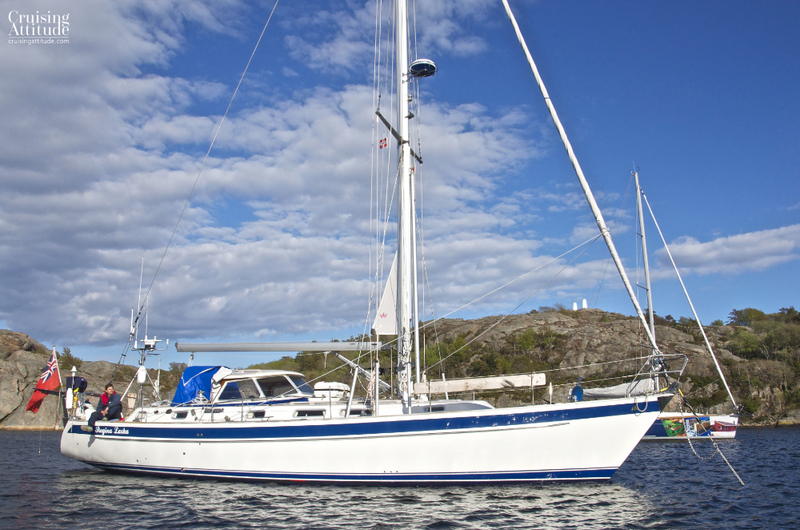 The price for Regina Laska (15 meters) was 200 NOK. Water, electricity, toilets, showers and laundry facilities are included. 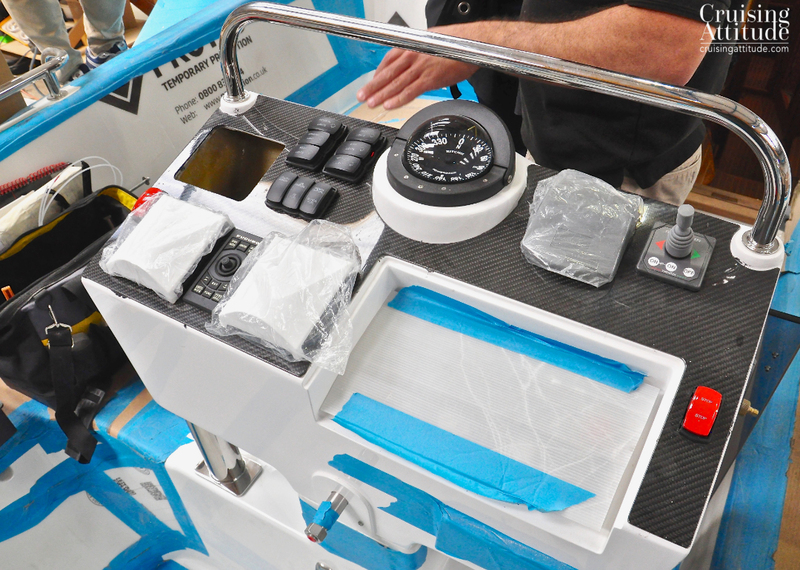 There is a fuel pump next to the marina, but if your boat is longer than 15 meters, you won’t fit into the slip. Leon only just managed, with his skilful boat handling, to squeeze Regina Laska in the slip. The village grocery store is located next to the fuel pumps — convenient though rather small. It’s not a long sail back to Stavanger, so we allowed ourselves an extra hour of sleep and were up at 8.30 instead of 7.30. By 10.00, we were on our way. This time, the sun was kind and stayed with us. Dark clouds hung above the hills and mountains, but above the waters, the skies were mostly blue. 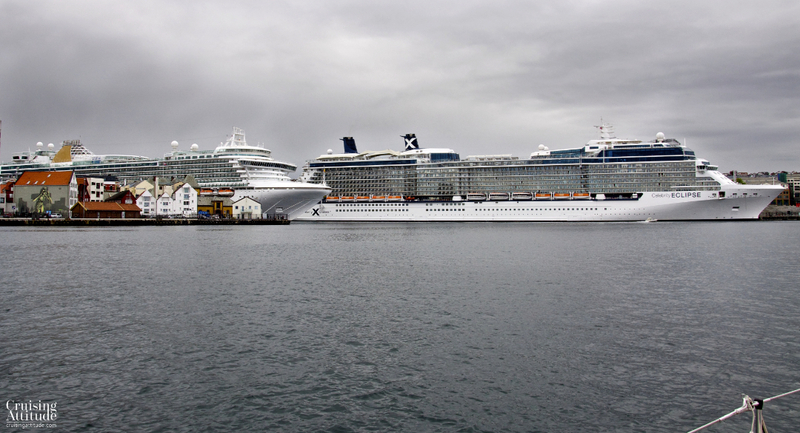 As we approached the inner harbour of Stavanger, we noticed two immense cruise liners that completely dwarfed the 3 and 4- storey buildings next to them. One was the Celebrity Eclipse (a great name, since the boat eclipsed half the Stavanger harbour) and the other was the Azura from P&O Lines. We were going to have to enter the marina by motoring between them. It was a surreal experience slipping by a boat that has an air draft of about 40 meters, and that’s not including the smoke stacks. 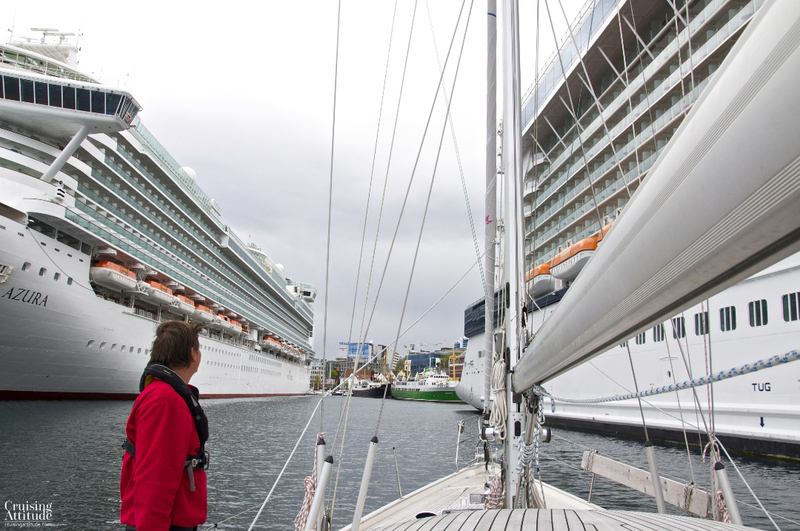 Approaching Stavanger’s inner harbour – notice how gigantic the cruise ships are next to the buildings! A second, totally independent autopilot as a backup (mentioned in our previous post). A Furuno satellite compass more accurate than a fluxgate, and, according to Leon, make the autopilot more stable. Your radar images also get a shadow so that you the course of the boats that radar has picked up. Furuno says that this is not for sailboats, but many Scandinavian sailors have it. 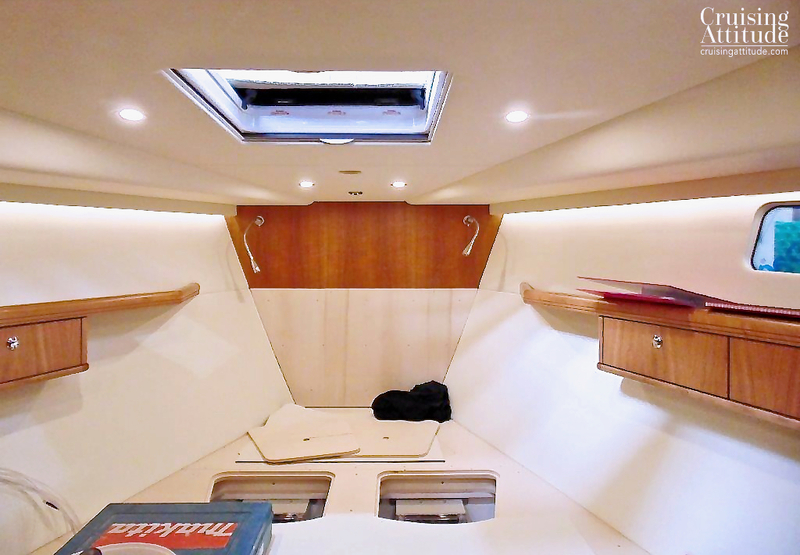 Getting started as a cruiser? Get some private coaching! I’ve mentioned Leon Schultz in several previous posts (here and here). 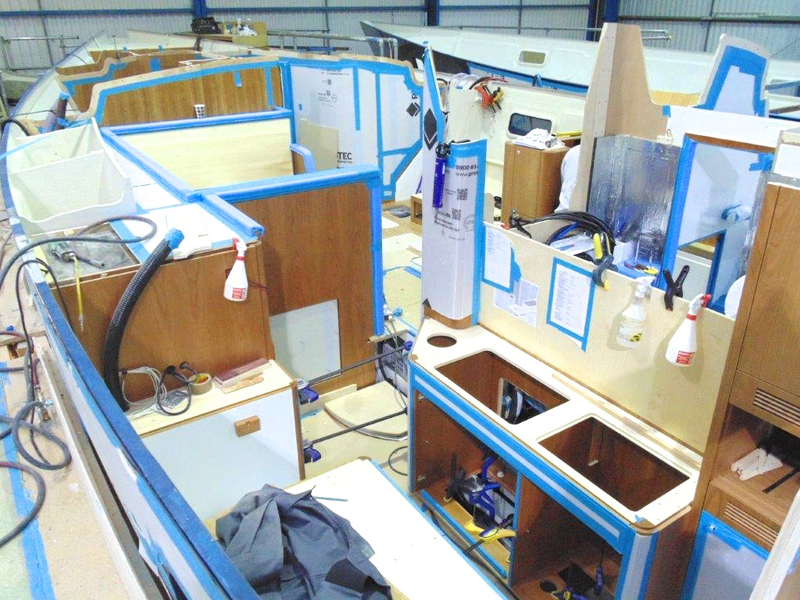 Leon is an RYA Yacht Master Ocean Instructor as well as a boat-refit consultant. 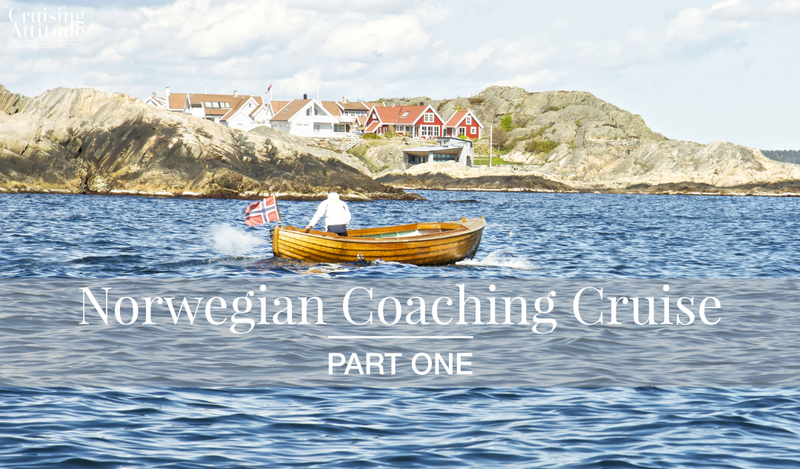 We thought it would be a good idea to do a week-long “coaching cruise” with Leon to learn big-boat handling. 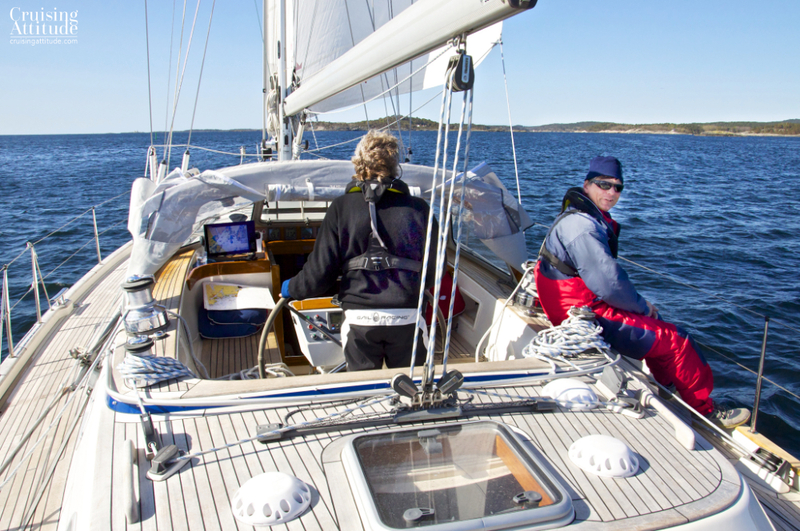 He often does “getting started as a cruiser” courses for couples who are ready to buy a new or larger boat, but perhaps want to try manoeuvres under the guidance of an experienced instructor. 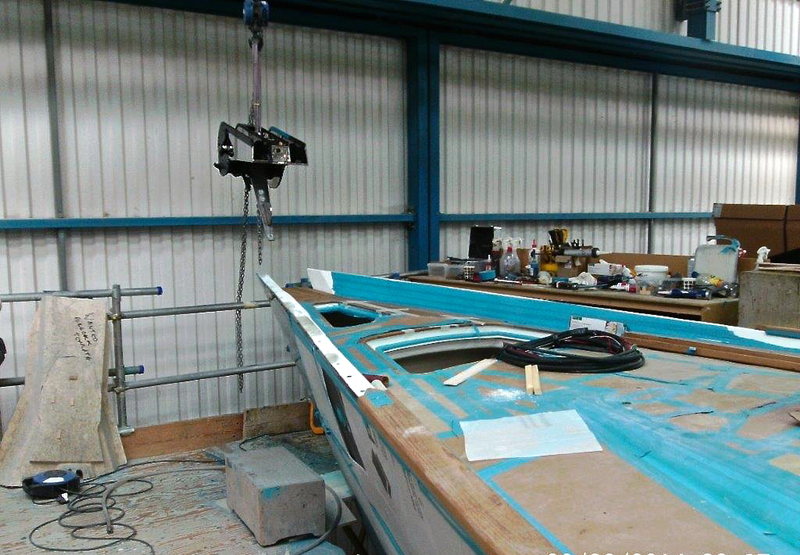 We had never handled a boat longer than 42 feet, or heavier than 9 tonnes and needed to prepare ourselves for our new boat (55 feet and 23 tonnes). 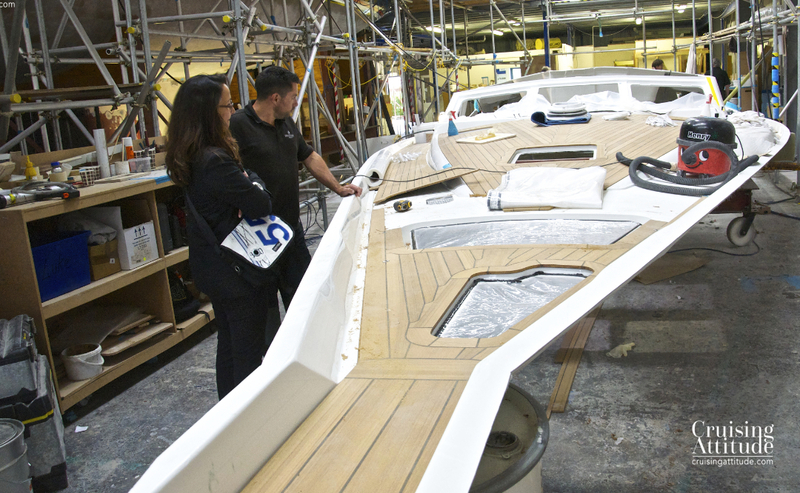 Leon’s boat, Regina Laska, has a hull length of over 48 feet and displaces about 17 tonnes. 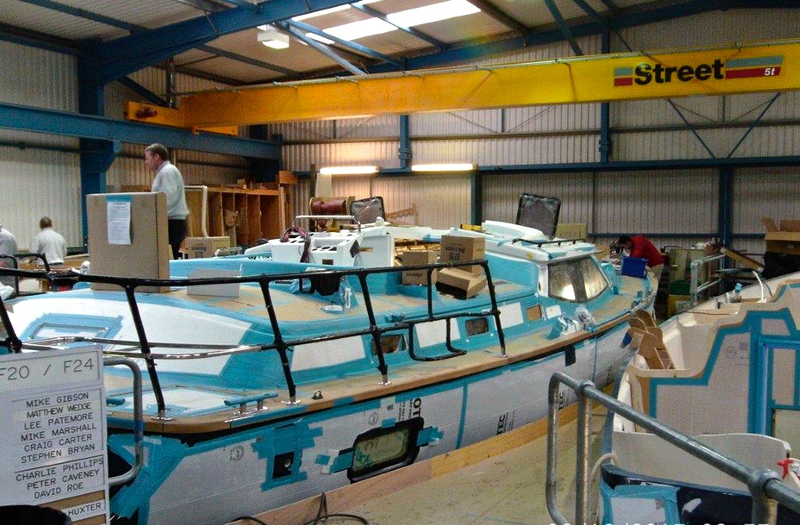 It has a similar hull structure and keel to our future boat. Perfect! Arriving on Leon’s Boat, Regina Laska on a chilly May morning. 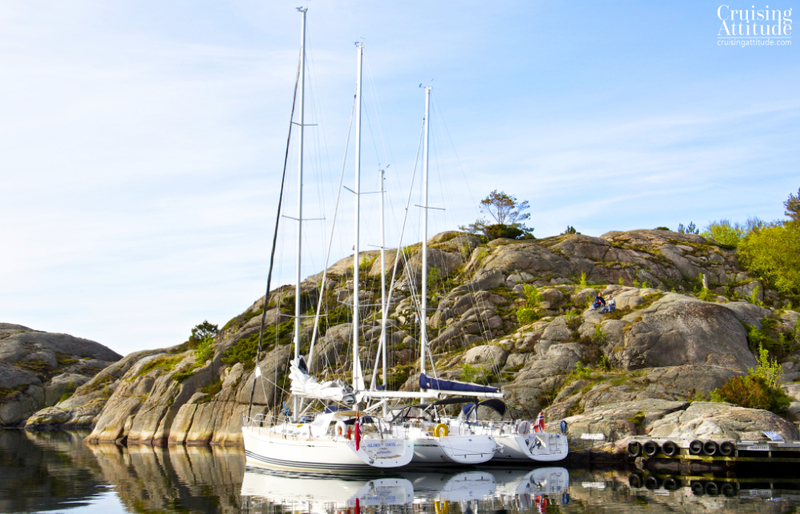 We set off on the 1st of May, a beautiful but chilly day on the island of Orust, Sweden. Our week-long cruise would take us directly over to Norway at around the same latitude. It’s normally not a great idea to start off with a day-long passage on open waters (seasickness!) but we had a weather window that would enable a lovely reach over to our first anchorage on the southern coast of Norway. 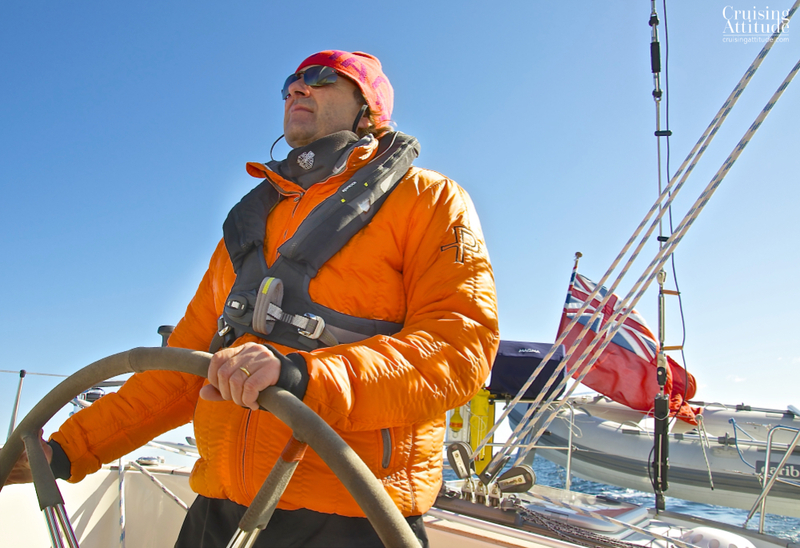 We both already knew how to sail, so the coaching didn’t cover that — what we did learn on the first day was how to think like a cruiser instead of a “week-end and holidays sailor”. 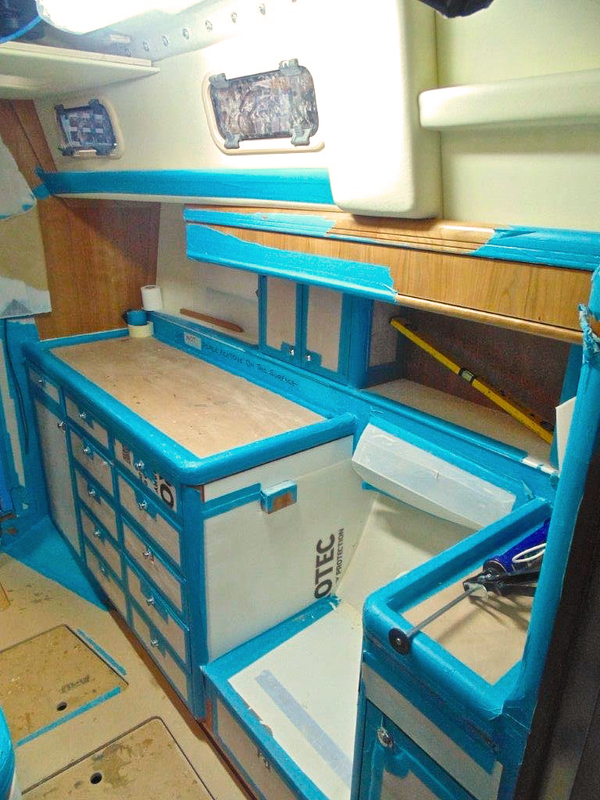 Things like being kind to your sails and equipment, the virtues of continuous maintenance and checking your equipment every day. 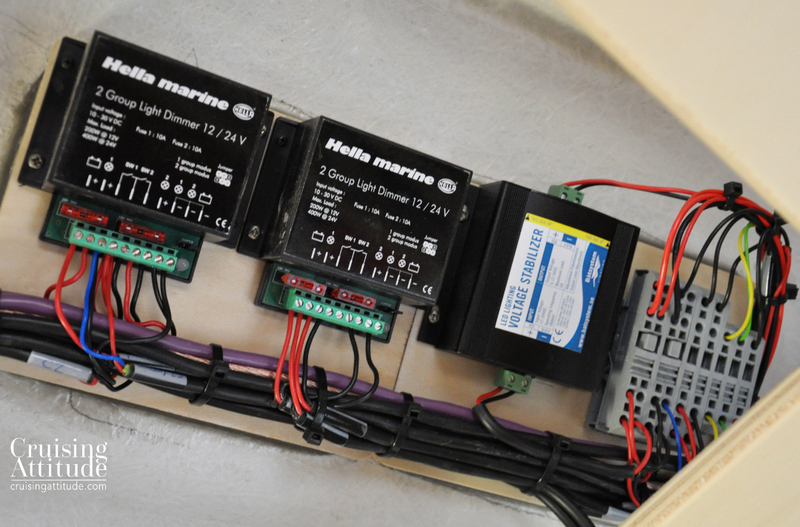 We also had the chance to get to know and use the Furuno constellation of electronics Leon has on his boat. We found his Navnet 14-inch chart plotter was easy to use, and easy to see, even with sunglasses and from an angle. Leon had integrated a bottom-discriminating sounder. This echo sounder, while not essential, is nice to have when anchoring up, especially in the evening when you just want to get it done without trying 20 different spots. It scans the bottom and tells you if the bottom is sand, mud, rock or gravel. 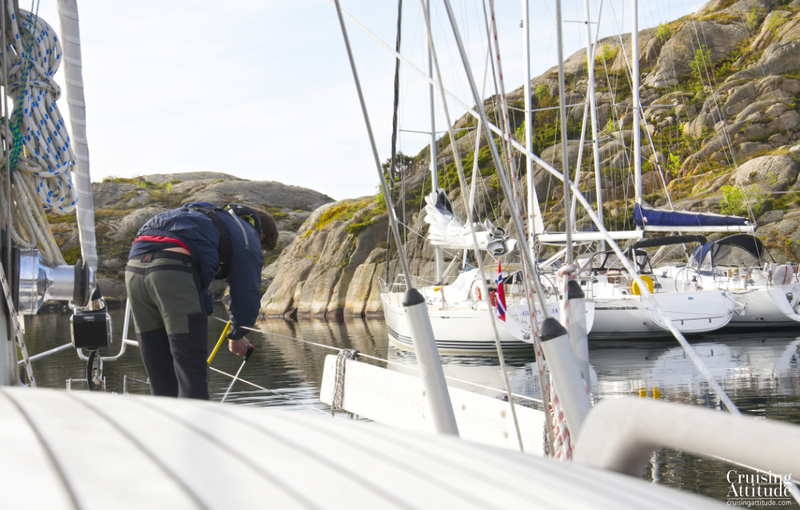 You still have to test if your anchor is holding by backing down on it as you normally would — it’s just nice be be able to pass up the spots where the sounder shows rock or gravel. It certainly came in handy on our first night. 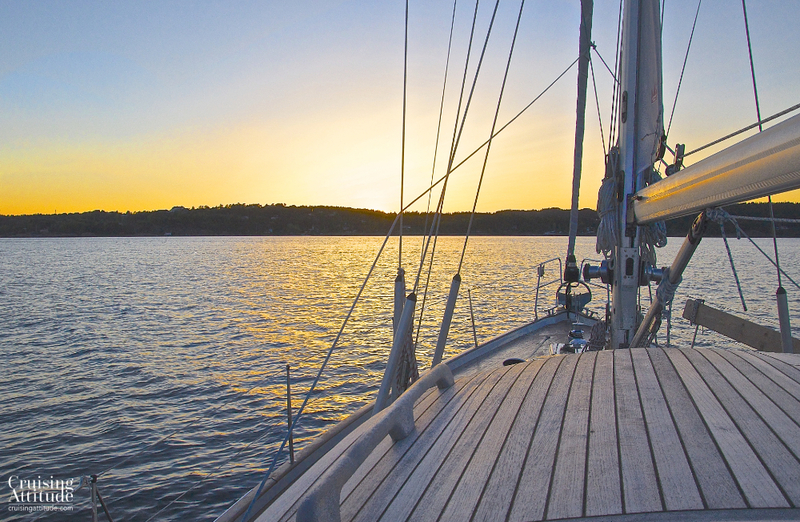 We arrived at our anchorage at around 22.00. The skies were not completely dark, but we didn’t have a lot of light. As soon as the bottom discriminator showed us mud instead of rock, we lowered the anchor. And it held, first try! We were hungry so Leon, an excellent cook, got down to preparing dinner for us. Leon is a fantastic cook! The sun greeted us with it’s full force the next day. 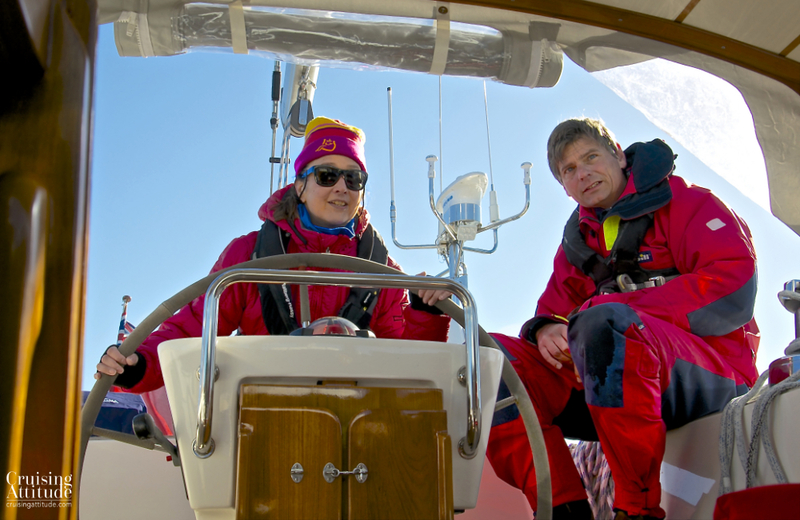 After a leisurely Swedish breakfast in the saloon (it was still quite cold), we were off for another day of sailing the beautiful south coast of Norway. Gorgeous, but cold weather and beautiful scenery along the southern coast of Norway. On our way to the anchorage at Olavssundet. Our goal for today was to reach the anchorage of Olavsundet (Ny Hellesund) early enough to have a walk on the islands and have a sauna. 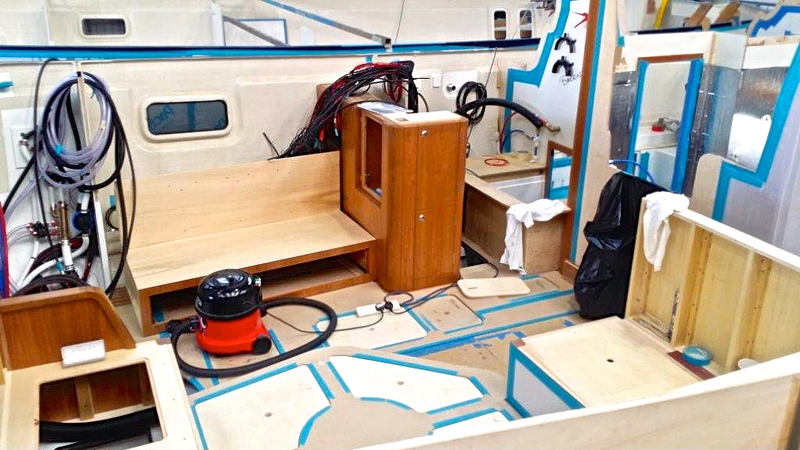 Yes, Leon has a steam sauna on his boat! 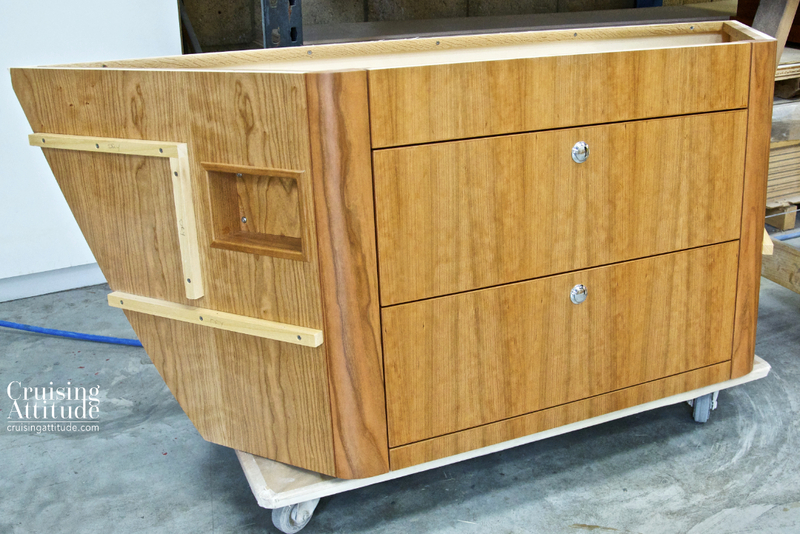 You can buy one yourself – Båtsystem in Sweden makes them. 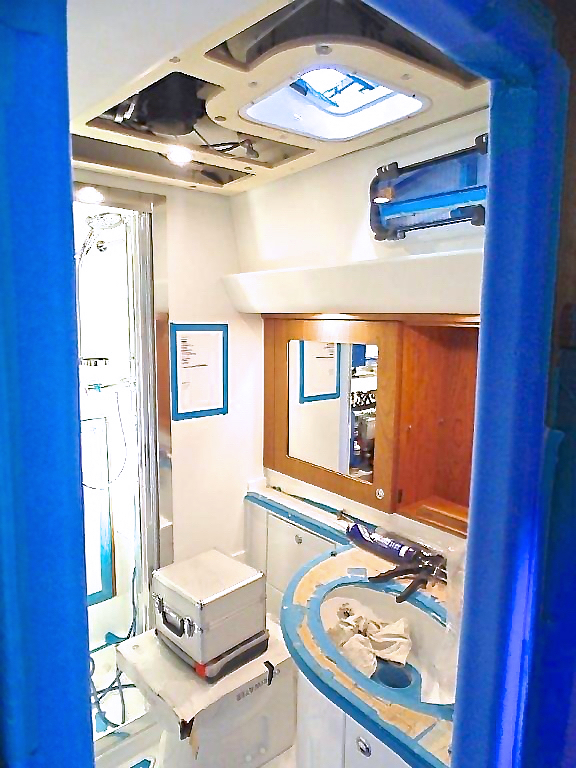 You need to install the “steamer” so that that tube comes out in the cockpit, and you hang up the vinyl sauna tent at the helmsman’s end of the cockpit. It got really hot in there, despite the outside temperature of around 6° C.
The steam sauna is the blue tent at the back of the cockpit. 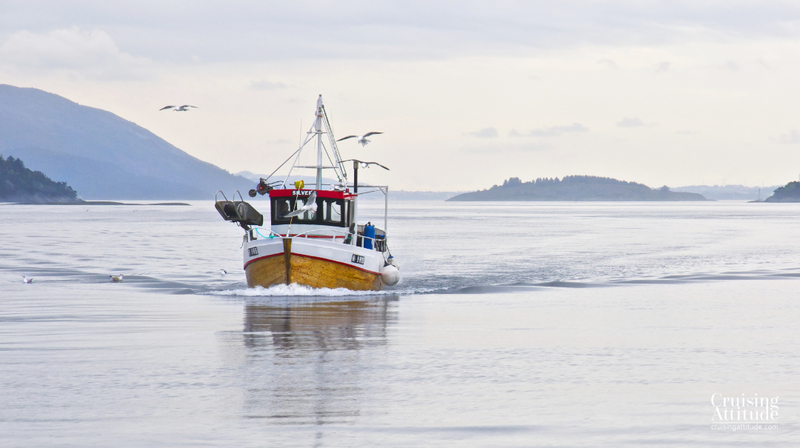 The island of Helgøya at the anchorage provides some breathtaking views of the sea and the anchorage – it’s worth the dingy ride to shore. 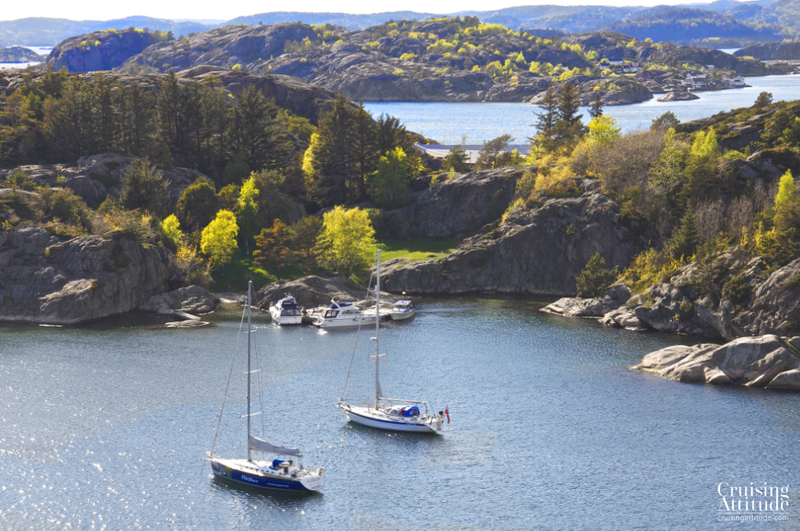 Our anchorage (between the islands of Helgøya and Kapelløya) at Ny Hellesund. The sun continued to shine — what fantastic luck we were having as Norway is not famous for entire weeks of sun. Perhaps it’s the microclimate in the south? 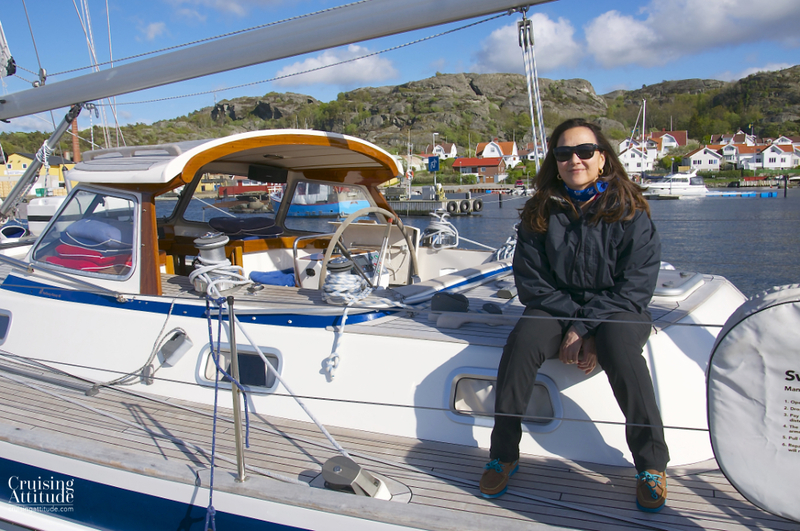 We weighed anchor with the goal of reaching Farsund – our first stop at a marina and an opportunity to practice big boat handling under motor. The wind had turned to a westerly direction so we had to decide weather we’d motor for awhile or tack down the coast. We were here to sail, so of course we said, “we’ll tack!” The wind speed had increased as well to a steady 25-29 knots with gusts up to 38. 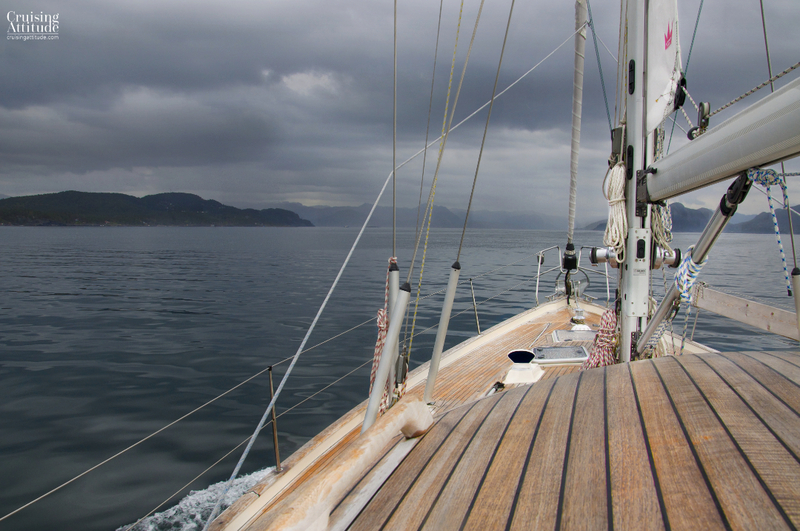 It was a sporty and wet voyage with both sails reefed. 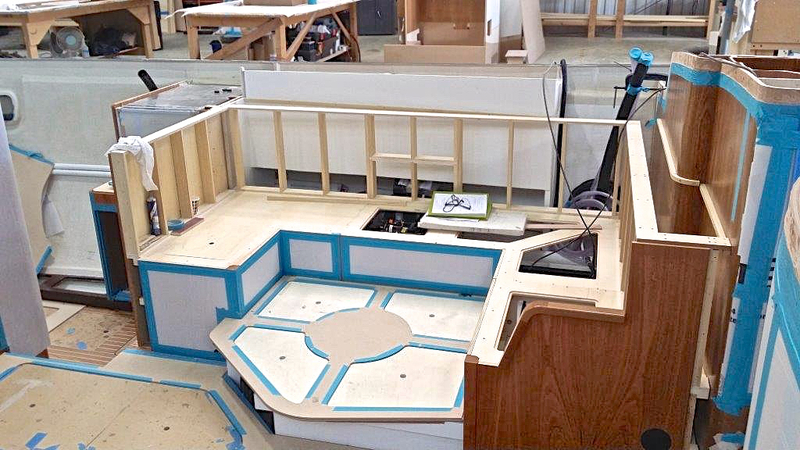 At lunchtime, we hove-to, to be able to use the galley in a safer way. We were far enough away from the coast and not near the shipping lanes. As it was quite cold (about 8°C) and very windy we wanted a warm lunch and decided to make some fish soup. 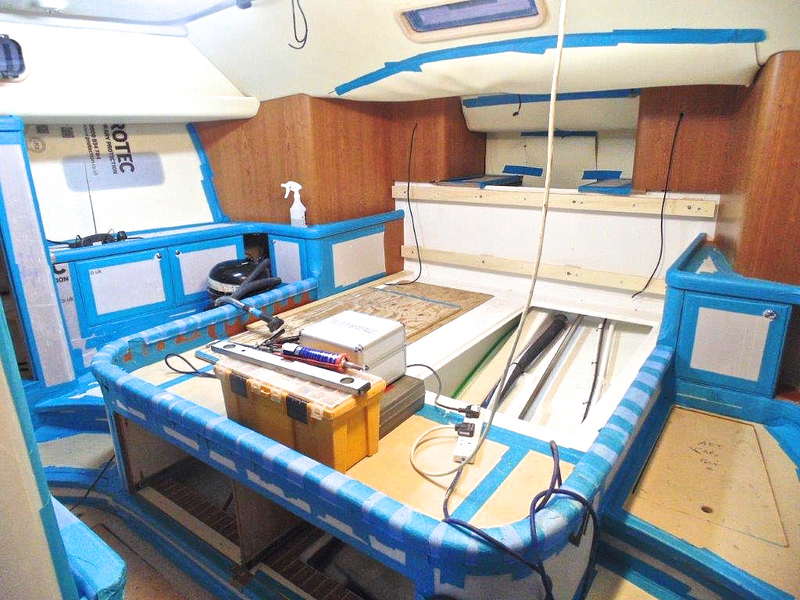 Regina Laska heaves-to perfectly and we noticed the famous “slick” the hull and keel makes on the windward side of the boat. After two bowls of hot soup and a cup of coffee, we were really to take on the Cape of Lindesnes. The Cape of Lindesnes is called the “Norwegian Cape Horn” because in hard weather, it’s a bit of a challenge. There’s a Gulf Stream current that comes up to the north coast of Denmark, hits Sweden and then goes back out west via the south coast of Norway. It was about 3 knots in speed and meeting 25-29 knots of westerly wind to the east of the Cape when we were there. It’s also where the Skagerrak and North Sea meet, causing strange localised currents. Finally, this part of the coast rises from a depth of about 200 meters to 20-30 meters near the coast, creating the energy to form big waves. 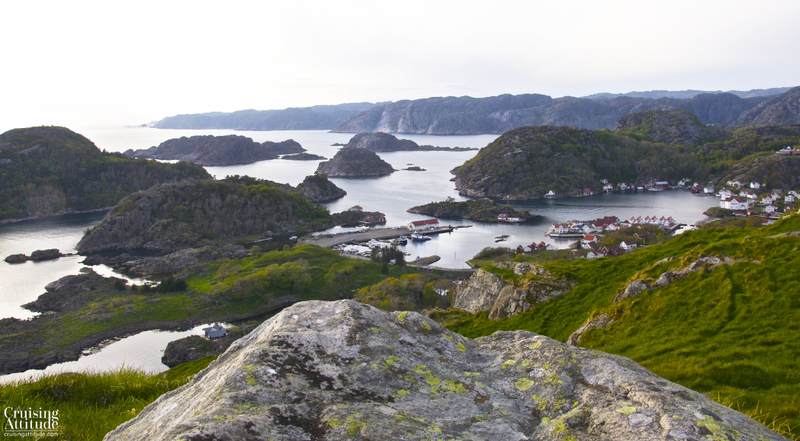 The area around Lindesnes, especially the stretch between Lindesnes and Lista, is known as a ships’ graveyard. Sorry there are no photos, but it was far too wet and rough to take out my camera!